As I gear up to start planning the upcoming first week of school, I am suddenly reminded that I never got around to blogging about what I did during the first week of school LAST year in it's entirety. I made a list, and I was shocked to find out that I did 21 different activities last year. I knew we did a bunch, but even I was shocked by that number! So, I've decided to blog about those activities in the hopes that it will inspire me to get started planning for this year! It is important to note that all of my students did not complete all of these activities. Please, do not try to fit in all 21 activities! I taught four preps last year with some of my classes overlapping, so I had to get creative to keep certain students from getting bored. Getting to Know You Quizzes - This was my second year to start out the first day of class with a quiz. Be sure to announce to the class that there is going to be a quiz, and it will be graded. Let them panic a bit. Allow them to think you must be the world's cruelest teacher. Then, pass out the quiz. When students insist that they can't possible take this quiz because they don't know you, just ask them to make an educated guess. Usually the siblings of former students do the best on the quiz. I always give a piece of candy or some other sort of prize to the student who gets the most questions right. I usually give students around five minutes to complete the quiz. Then, I go over the answers. Afterwards, I give students a chance to write a quiz about themselves for me to take. Last year's students thought it super unfair that my quiz was free response when the quiz they were writing for me was multiple choice. I take each student's quiz after school on the first day and return them first thing on the second day. 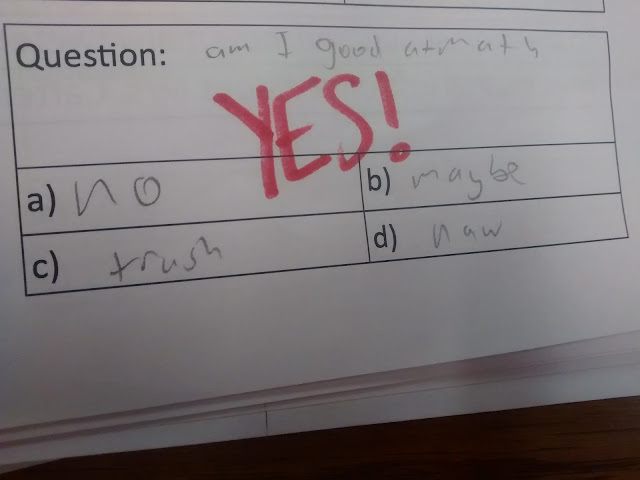 Students love grading my answers. They are always sure to let me know just how well or how badly I did. Some students are really tricky with their questions, and I frequently get 0 questions right on a students quiz. Kids do get weirded out by my lucky guesses, though. I often heard "How did you know that?!?" Name Tents - Last year, five of my six classes consisted of almost completely freshmen. This meant I had what felt like a zillion new names to learn. Sara VanDerWerf inspired me to have my students make a name tent on the first day of school. For the first week, students would get out their name tent at the beginning of each class period. This made it so much easier to learn names! 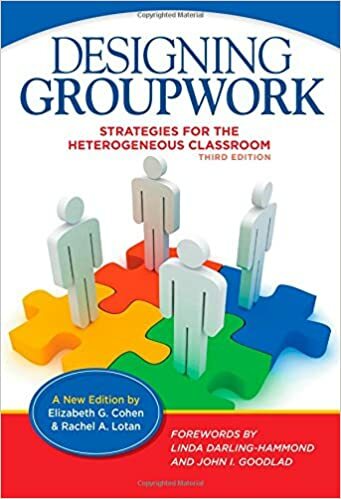 Broken Circles - I learned about the Broken Circles activity while reading Elizabeth Cohen's Designing Group Work: Strategies for the Heterogeneous Classroom (affiliate link to 2nd Edition / 3rd Edition). After reading the description, I knew I *had* to try it out with my students! Cohen notes that the activity was developed by Nancy and Ted Graves who were inspired by activity known as Broken Squares that was invented by Dr. Alex Bavelas. Students are placed in groups of 3-6. Each student is given an envelope that contains 2-3 puzzle pieces. 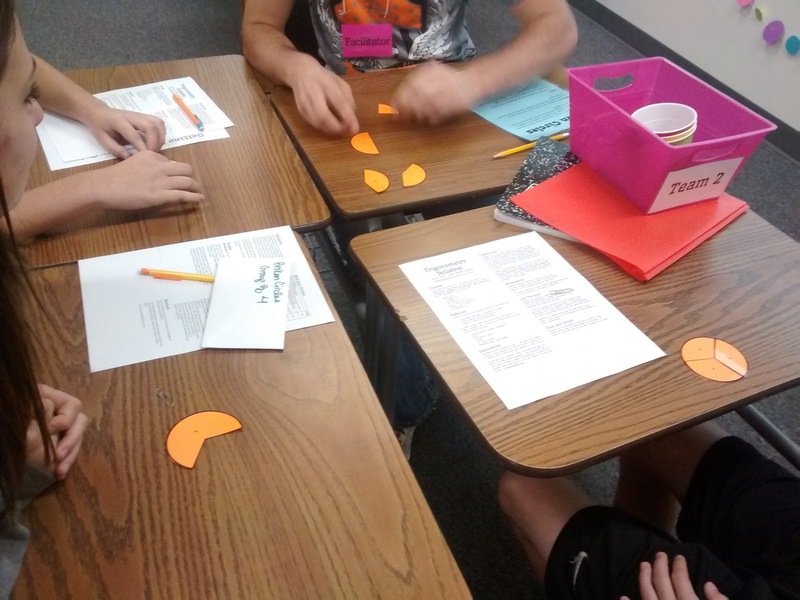 The objective of the activity is for students to put their pieces together in such a way that each student has a complete circle. There are a few specific rules that must be followed. You can read them in the instructions below. 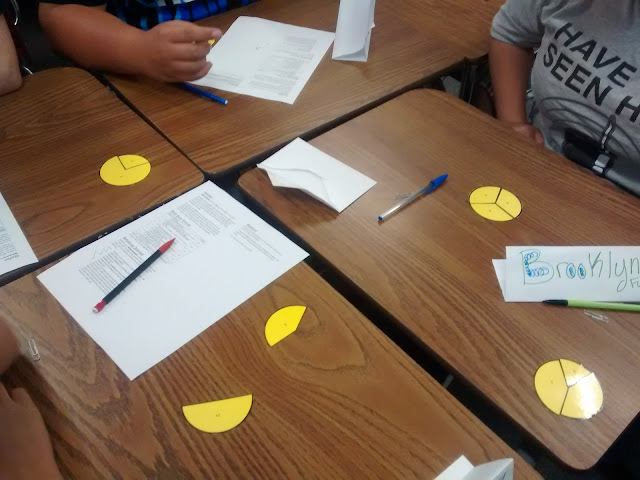 This activity requires students to cooperate and demonstrates the importance of cooperation in the classroom. One person in the group will receive pieces that already form a circle. 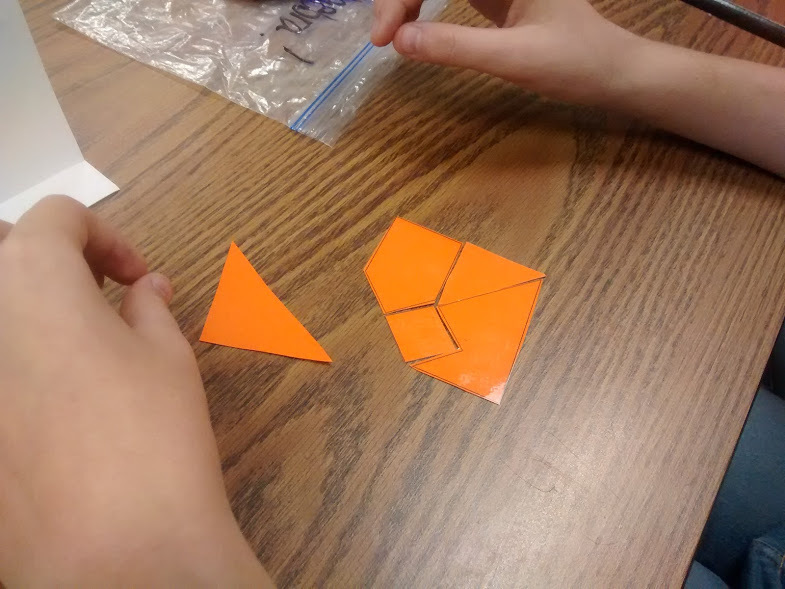 However, when the rest of the group tries to make their own pieces into circles, they will be unsuccessful. 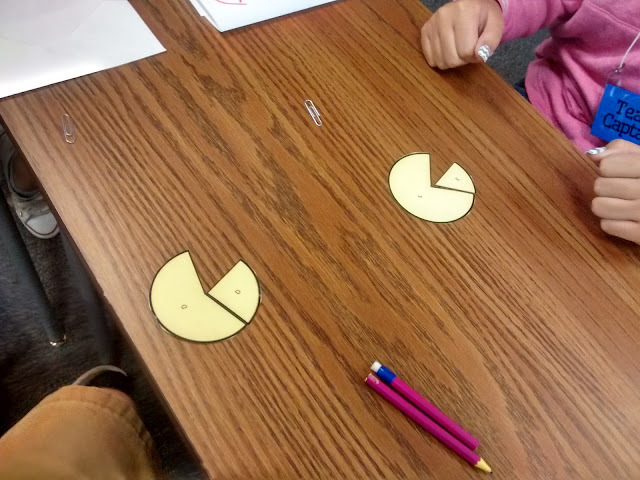 It won't be until the person with the complete circle decides to give some of their pieces to the other students that ALL of the students will be able to make a complete circle. What an important lesson! 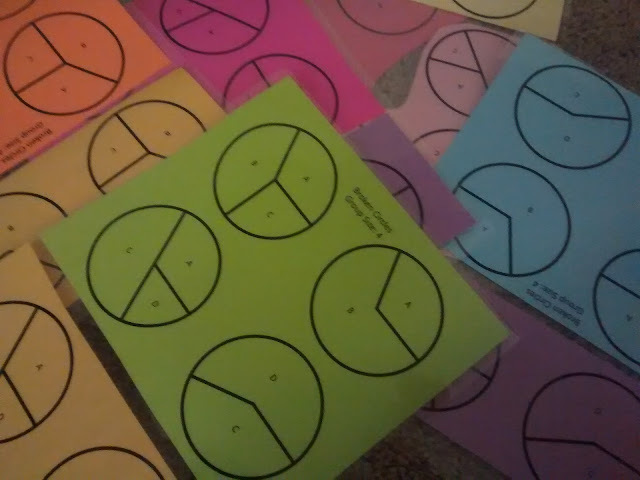 You can read the details of Broken Circles in their entirety and get the free printables I created to carry out this activity here. 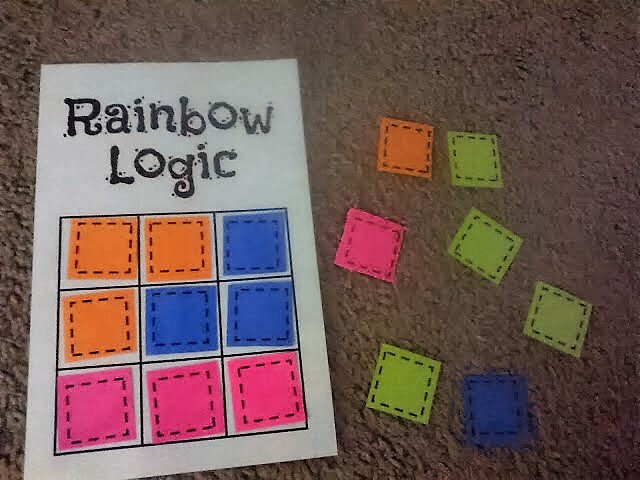 Rainbow Logic - This is another activity I learned about from reading Cohen's Designing Groupwork (affiliate link). 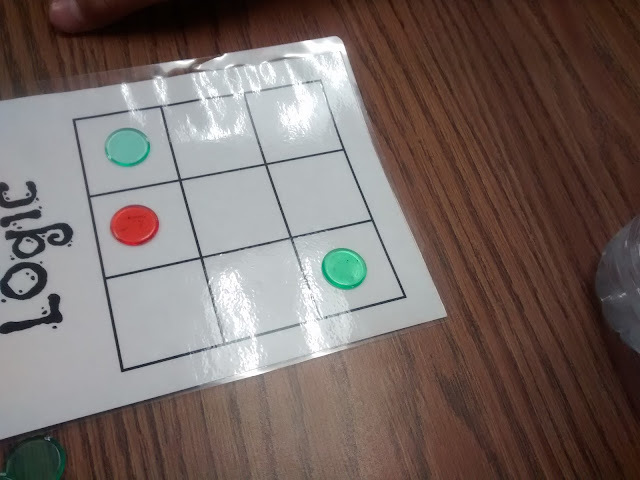 This activity requires a gameboard and sixteen colored squares for each student. I also used testing dividers (affiliate link) to keep the grid keeper's board hidden from the rest of the group. Here's what the gameboard and pieces look like. I have uploaded the files for you to download for free here. The general gist of the game is that one person in the group makes a colored grid in secret. However, you can't make just any grid. You can only use three colors, and you must use three of each of the three colors. And, all of the squares of the same color must be connected by at least one full side. 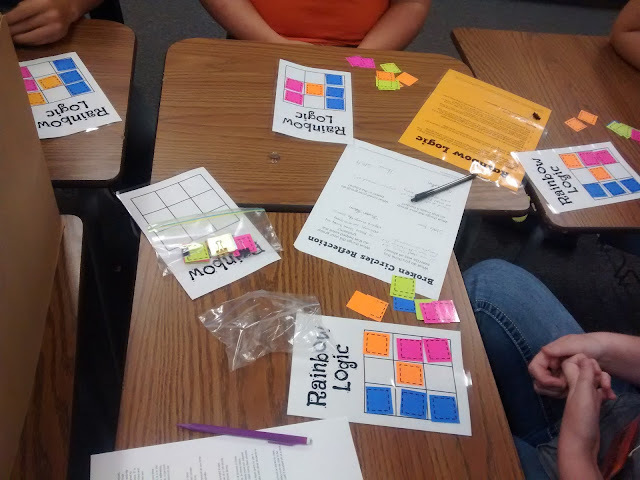 Once the grid is made, the group discusses which questions they should ask to figure out what color goes in each box of the grid. They need to discuss their questions before they choose which one to ask to see which questioning path will hopefully be the most efficient. The goal is to figure out the grid in the least possible number of questions. My students really enjoyed this activity. They didn't want to stop until everyone had a turn as "Grid Keeper." You can read more about this activity in detail here. Build It - I learned about Build It from Stanford's website. The activity is from the book Get It Together: Math Problems for Groups Grades 4-12 (affiliate link). Each student was given one or two cards. 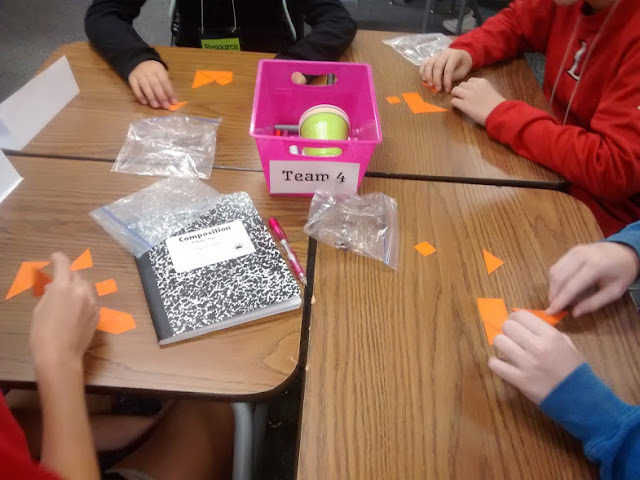 Without showing their cards to their teammates, they had to use their linking cubes (affiliate link) to build the prescribed object. I love that this activity encourages students to work together cooperatively to achieve a single, final product. Because each student can only see their own card(s), they need the other students in order to succeed. Students have to have a plan to be successful! 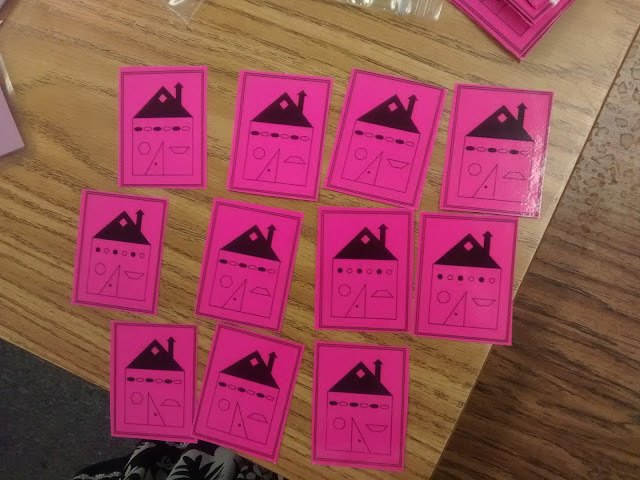 My students were so excited when they figured out each puzzle! Thirteen - I learned about this game from Julie Morgan's awesome blog. Julie teaches maths in Scotland, and she is always full of fun ideas! 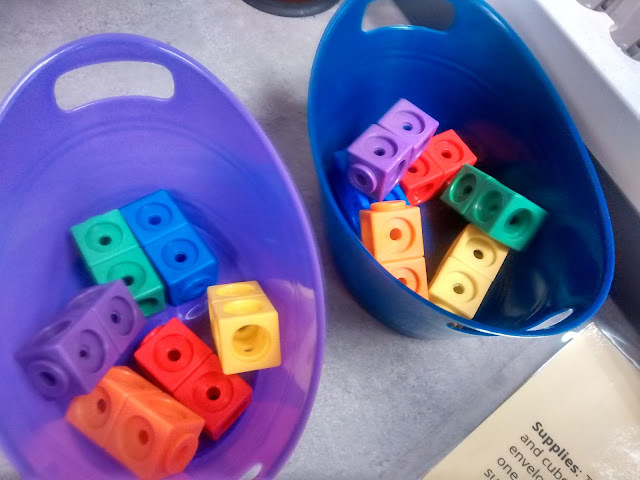 Her blog is my go-to when I'm looking for a super short but math-y activity to use with my students. I have to say, though, that I did not realize how much my students were going to fall in love with this game. They asked to play it at least once a week for the entire school year. The gist is simple. Stand in a circle. Choose someone to start. That person can say either one number, two numbers, or three numbers. So, the first person could say "1", "1, 2", or "1, 2, 3." Depending on what the first person said, the second person can now say the next one, two, or three numbers. Play continues around the circle until someone says THIRTEEN. That person is out. Play continues again around the circle until only one person remains. My kids get super competitive with this, and it's so fun to watch them (especially when their strategies backfire!). 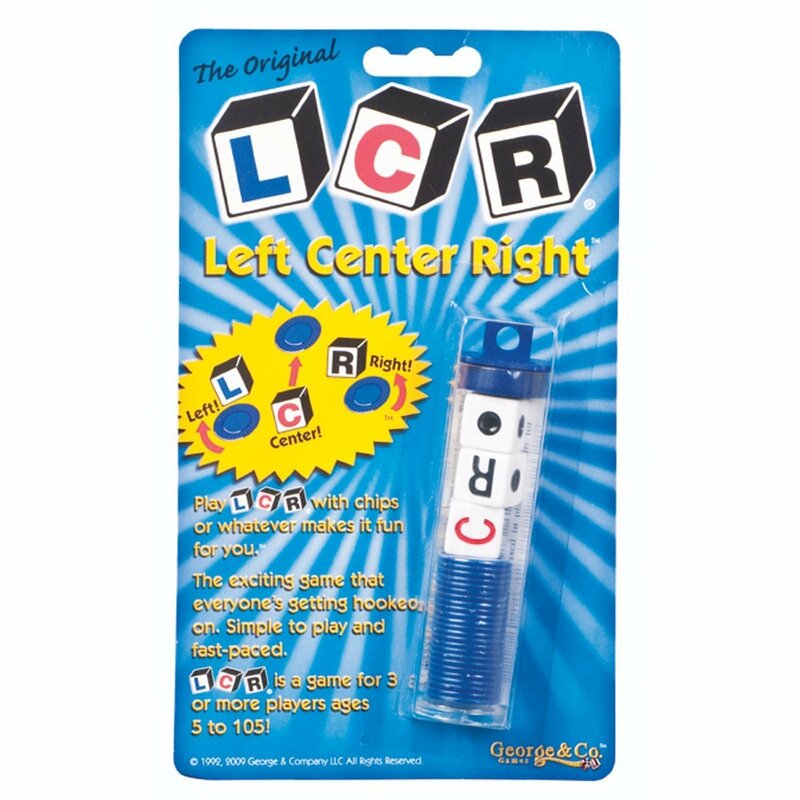 Left Center Right - Left Center Right (affiliate link) is a quick dice game that my students always love. Our middle school math teacher has played this game with starbursts or other wrapped candy instead of the plastic discs. 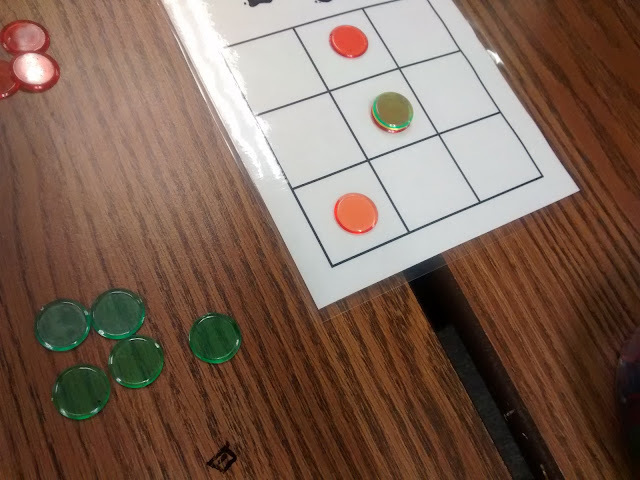 I had more students playing than the discs allowed, so we used bingo chips (affiliate link). One thing I love about this game is that even if you're out of the game, you can still end up winning! It's great for discussing statistics and probability. 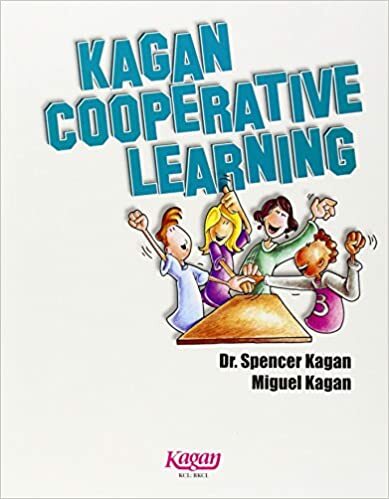 Desert Survival - I learned about this activity from reading Kagan's Cooperative Learning book (affiliate link). Though, a search for this activity on google shows that it is included in numerous books. See here, here, here, here, and here. As a group, students had to rank the 14 items salvaged from the plane in order of importance for survival. This leads to some very interesting conversations! 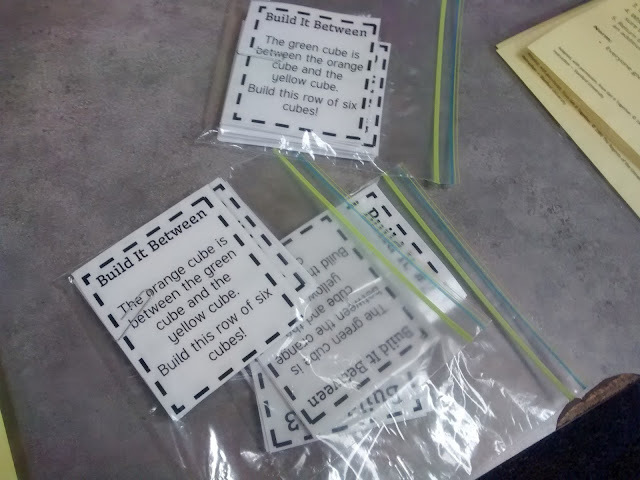 The files I created for this activity can be found here. Guess My Rule - This is yet another activity that I learned about by reading Cohen's Describing Groupwork (affiliate link). Can you tell that I am a little obsessed with that book? 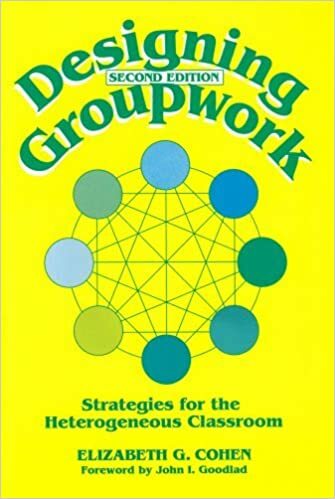 It is by far the best book I have ever read about group work! You will need a set of shape cards, a set of rule cards, and a piece of yarn or string to make a circle. One student is chosen to be the rule keeper. They choose a rule, read it, and keep it to themselves. The other students in the group take turns handing a shape card to the rule keeper. 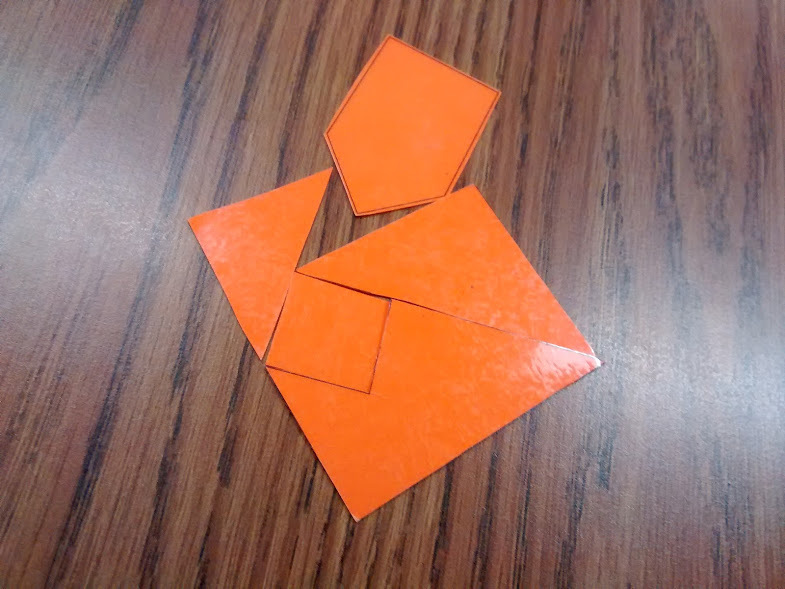 The rule keeper must decide if the shape card meets the rule or doesn't meet the rule. 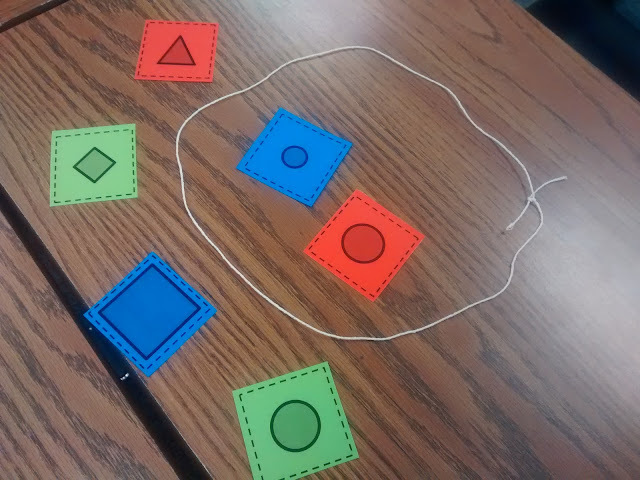 Cards that meet the rule are placed inside the circle and vice versa. The group must work together to figure out what the rule is. 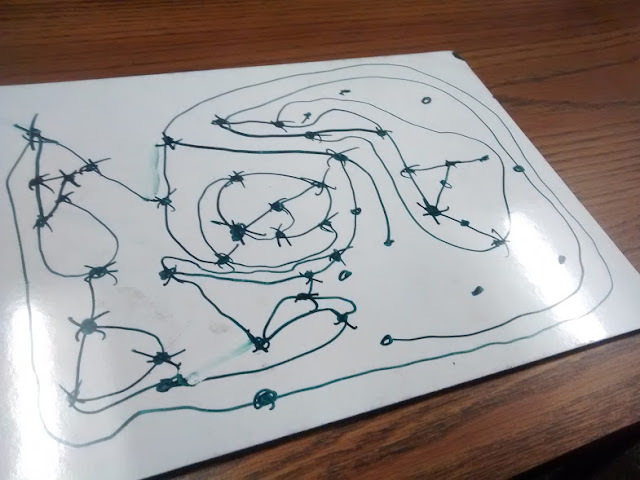 My students ended up spending about half of a fifty minute period working on this activity. I have uploaded the files needed to create this activity here. 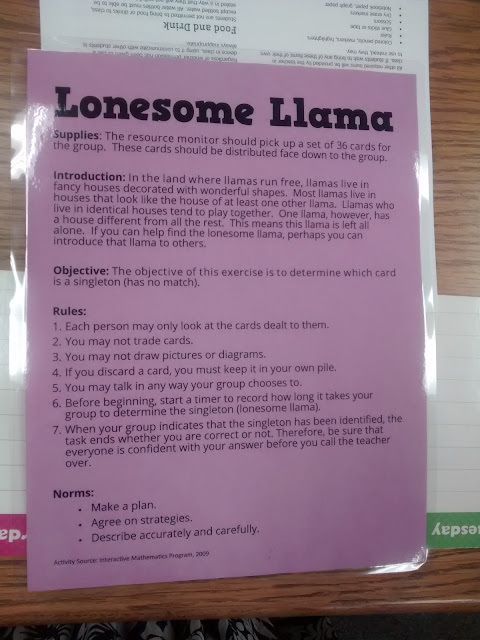 Lonesome Llama - This activity is from IMP. I used this activity with juniors and seniors last year, and they really struggled with it. 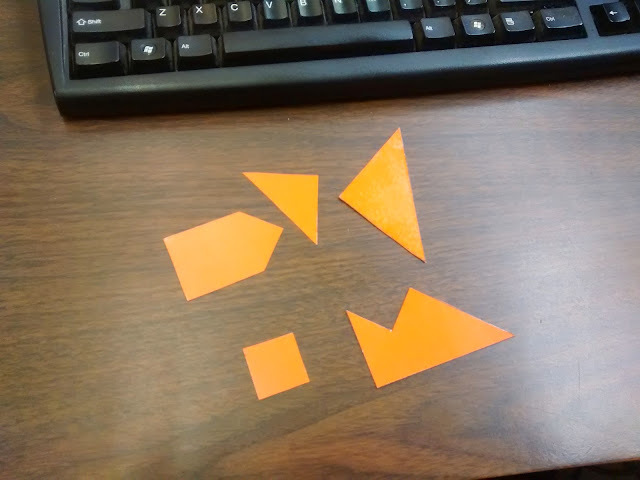 My students spent a bit over thirty minutes on this activity. Some groups were successful while others ended up giving up. I don't think my students realized just how careful and precise they would have to be with their language and description in this activity. Groups are given a deck of cards that are to be dealt evenly between the group members. Each student may only look at their own cards. 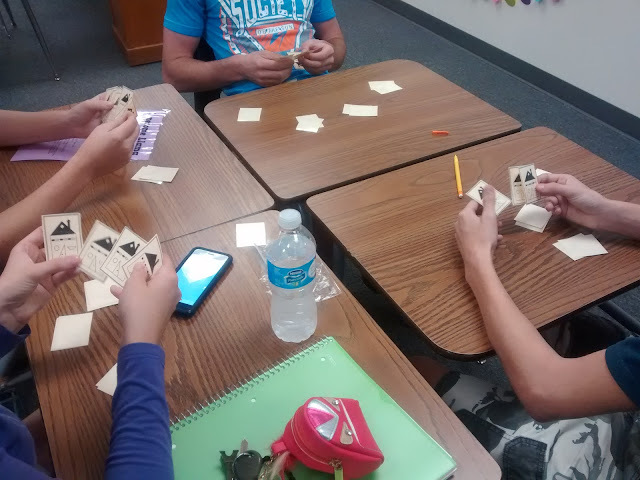 They may describe their cards in words to the other students, but they cannot let another student see their cards. Here's the introduction that should be given to students: In the land where llamas run free, llamas live in fancy houses decorated with wonderful shapes. Most llamas live in houses that look like the house of at least one other llama. Llamas who live in identical houses tend to play together. One llama, however, has a house different from all the rest. This means this llama is left all alone. If you can help find the lonesome llama, perhaps you can introduce that llama to others. Students have to work together to determine which llama house is the "singleton." If you don't have access to the IMP curriculum, Stanford offers two very similar activities on their complex instruction website: Island Maps and Lots of Dots (must download zip file). Both versions involve challenging students to identify the singleton card. Sprouts - Sprouts is a mathematical game that was invented by two mathematicians: Conway and Paterson in the 1960s. I remember reading about this game as a kid in a book of mathematical games that lived on the bookshelf in my family's living room. The rules are easy to learn, and the only things required are something to write with and something to write on. 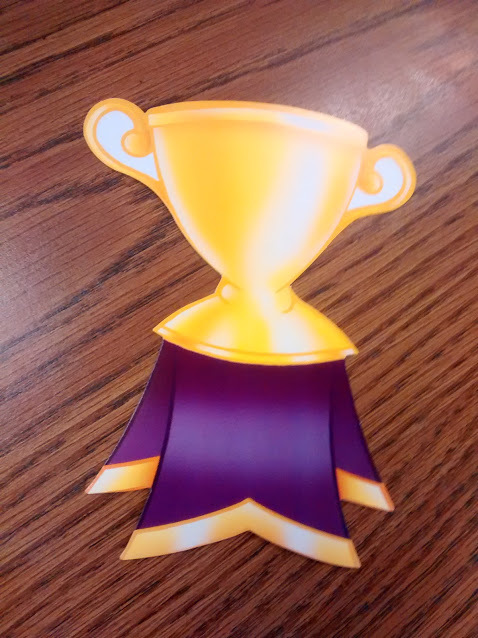 My kids LOVED this activity, and we actually ended up having a Sprouts Tournament in one class that ended with a paper trophy being awarded to the winner! 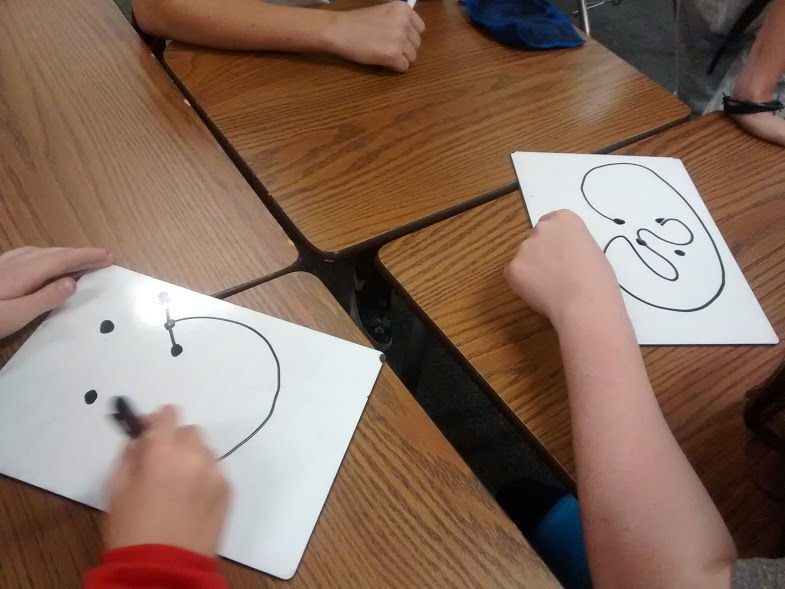 Some of my students got SUPER competitive and wanted to try a large number of dots to begin with. Evidence below. 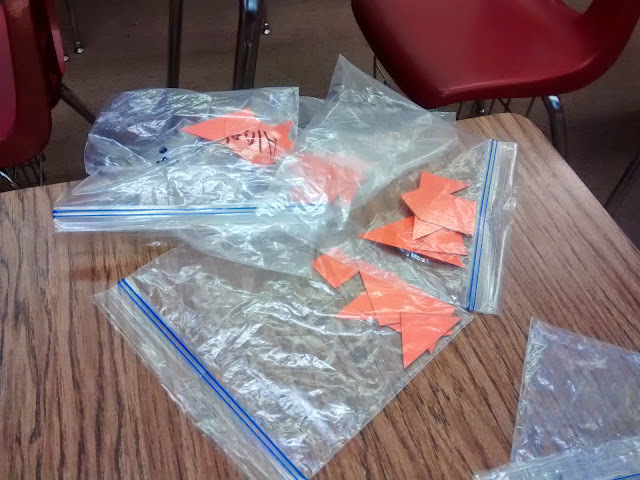 Make a Million - This is another activity that I learned from Julie Morgan's Fraction Fanatic blog. 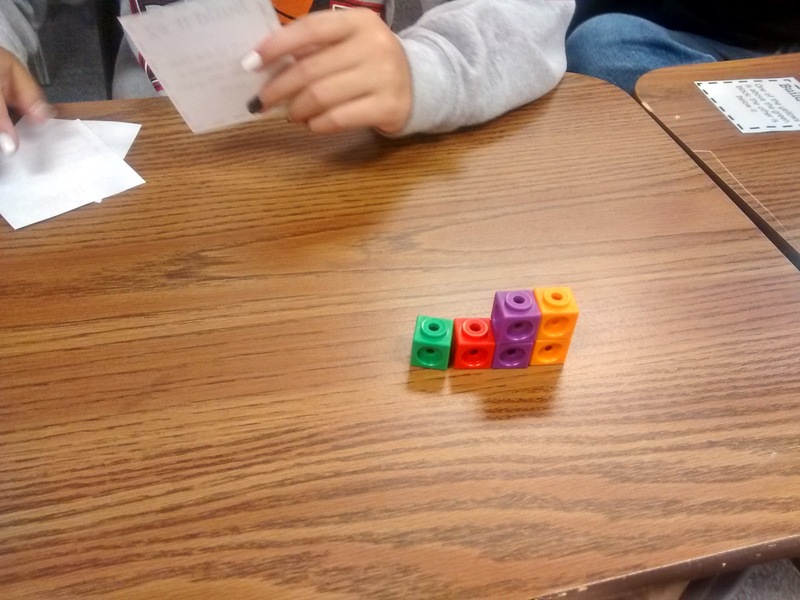 The hardest part of this activity is explaining to students how to draw the boxes. When I use this again, I plan on making a dry erase template for our dry erase pockets (affiliate link). Usually, the first time we play this, my students place the numbers almost randomly. After seeing how things play out, it is exciting to see how their strategies start to change! 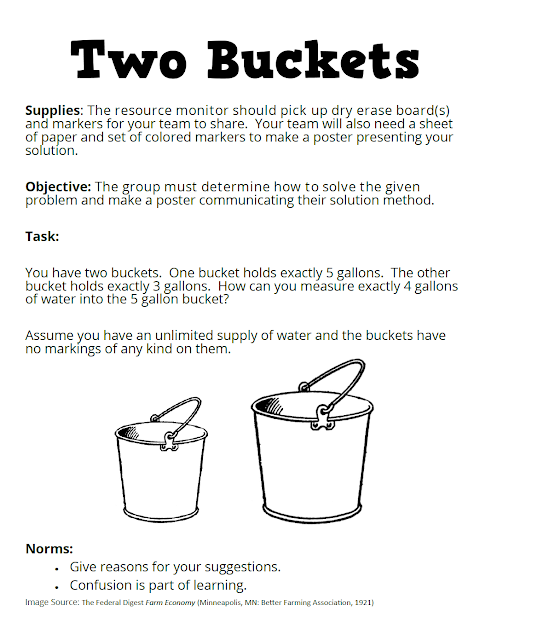 Two Buckets - Most likely, you've ran across some variation of the two bucket problem at some time in your life. You have two buckets. 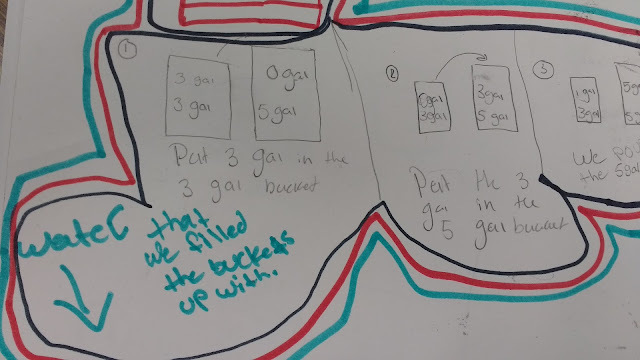 One bucket holds exactly five gallons. The other bucket holds exactly three gallons. 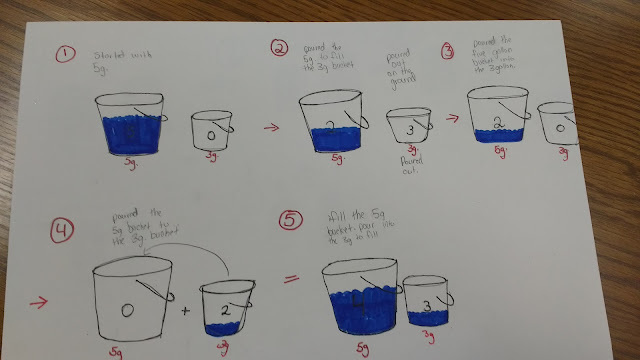 How can you measure exactly four gallons of water into the five gallon bucket. Last year, I posed it to my physical science students during the first week of classes. I challenged my students to work together to produce posters describing the process with words and illustrations. I have uploaded the file I created for this activity here. 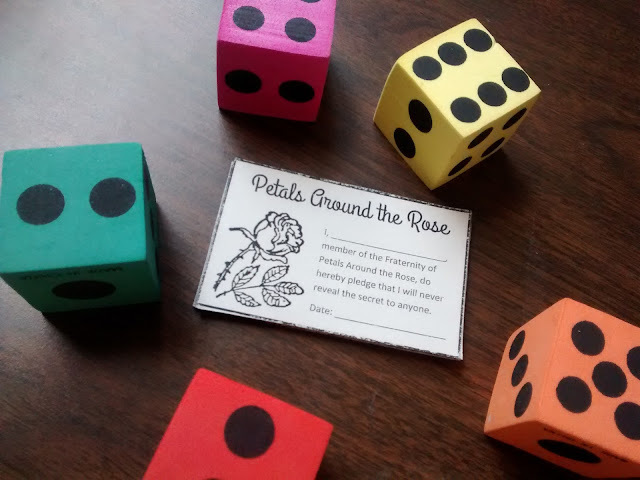 Petals Around the Rose - I learned about this brain teaser activity from Annie Forest's blog, and it's been a staple in my classroom ever since. If you're unfamiliar with the game, I have found that the best way to learn is to try your hand at this online version. Five dice are rolled. Guess the score. The only rule is that the name of the game is important. If you're curious the score you should guess for the above roll is 0. Why? The name of the game is important. Petals Around the Rose. After playing a few rounds on the SMARTBoard, students start to form theories. I ask them to keep their theories to themselves. Instead, I invite them to test out their theories. I roll the dice again and ask them to inform the class of the score. I won't believe that a student has figured out the secret of petals around the rose until they can get three rolls in a row correct without assistance from classmates. When students figure it out, they are sworn to secrecy. They get a membership card for the Fraternity of Petals Around the Rose, and they get to sign their name on a poster that hangs in my classroom. You can download the files for these here. As some students figure out the secret, the other students become increasingly frustrated. It's pretty adorable when the students who have figured it out remind the students who have yet to get it that "The name of the game is important." I have had students leave class and download an app version which they have played until they finally figured it out. 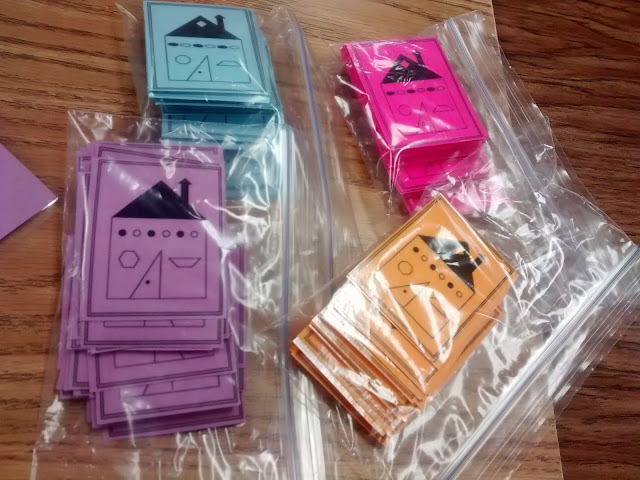 Other students like to take the game home and challenge their family members to figure it out. Even though this is kind of a one-off activity since it's no fun once most know how it works, kids still beg to play it again ALL. YEAR. LONG. 1-4-5 Challenge - I printed and laminated a set of these brain teasers a few years ago, and they are perfect to pull out when you have five or ten minutes that need to be filled. This also makes a great activity for emphasizing growth mindset during the first week of school. You can download a printable version of this activity and read all the details here. Using these five pieces, I issue three challenges of increasing difficulty to my students. First, using exactly one piece, make a square. That's easy enough. Next, using exactly four pieces, make a square. This is a bit tricky, but most students find it do-able. Finally, using all five pieces, make a square. This one is super tricky. So tricky that many students start to think that it must be impossible. Until, of course, one of their classmates figures it out! Train Game - The true name of the train game is 20 Express (affiliate link). But, it quickly got coined "The Train Game" by my students a few years ago. I received this game as a gift a few years ago, and I knew that I had to use it with my students. According to Blue Orange's website, the game has been discontinued. But, they do offer free downloadable game sheets that are the main thing you need to play the game! You will also need a set of number cards to draw from. 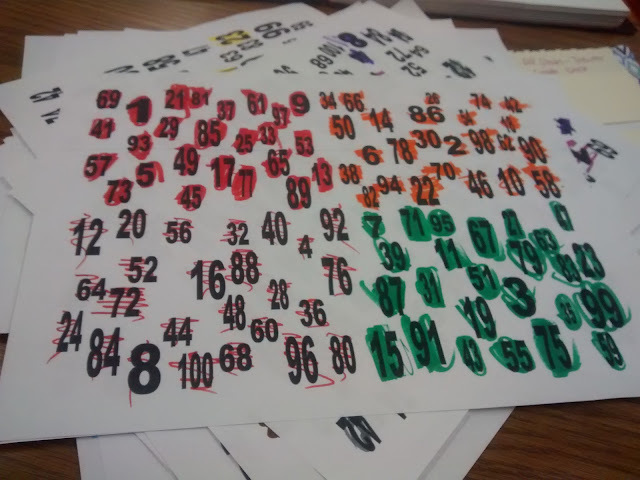 In the past, I've made a set of these numbers from bingo chips, popsicle sticks, and laminated paper. Whatever you use, you will need forty of them. You'll need the numbers 1-30. Then, you'll need an additional set of 11-19. Finally, you'll need some sort of wild card. In the game, they represent this by an asterisk. As number cards are drawn, students must decide which train car to write each number in. Once a number is written, it may not be erased or moved. The goal is to get as many numbers placed in increasing order as possible. The score chart in the middle shows that longer strings of increasing values are worth more points. My students are usually super confused the first time we play this game. Then, their competitive sides come out! I print out the game cards and slide them into dry erase pockets (affiliate link) to make them easily reusable. Traffic Light Game - This is yet another game that I learned about from Julie Morgan who learned about it from NRICH. Julie mentioned in her blog post that students will most likely need to see a demonstration game played. I definitely found this to be true! I played a game under the document camera, explaining every step along the way. We used red, yellow, and green bingo chips. 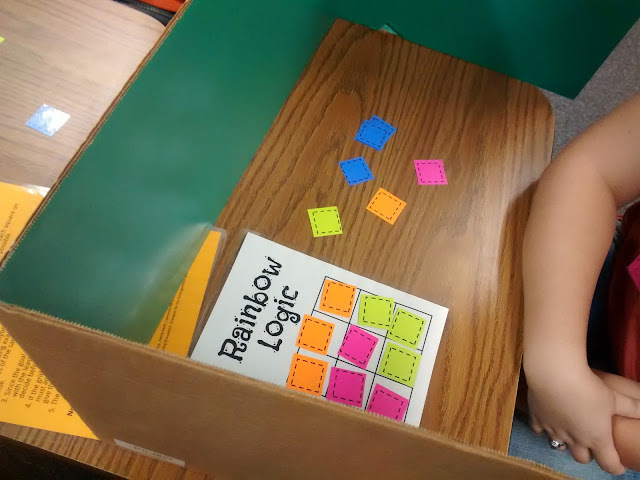 I didn't have time to make a special game board for this activity, so we just used our Rainbow Logic gameboards. Once my students caught on to how it worked, they really enjoyed it. I had to keep reminding students that they always have three choices. Place a red chip on an empty square. Change a red chip to a yellow chip. Change a yellow chip to a green chip. The first player to make a move that results in three chips of the same color in a row wins. I tried this last year with my lowest level class (Math Concepts) and my highest level class (Trigonometry). My math concepts students struggled to understand and apply the rules correctly. My trig students really got into the activity, and they ended up setting up a bracket for a tournament. 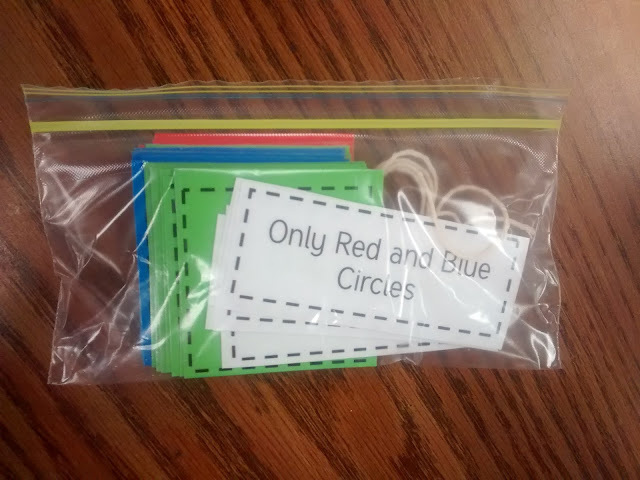 1-100 Activity - This activity is a keeper from Sara VanDerWerf. 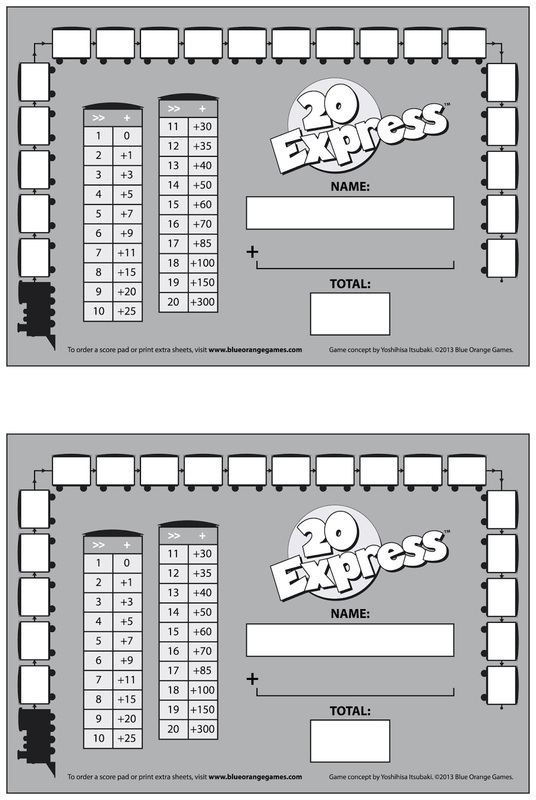 Groups are given a sheet with the numbers from 1 to 100. 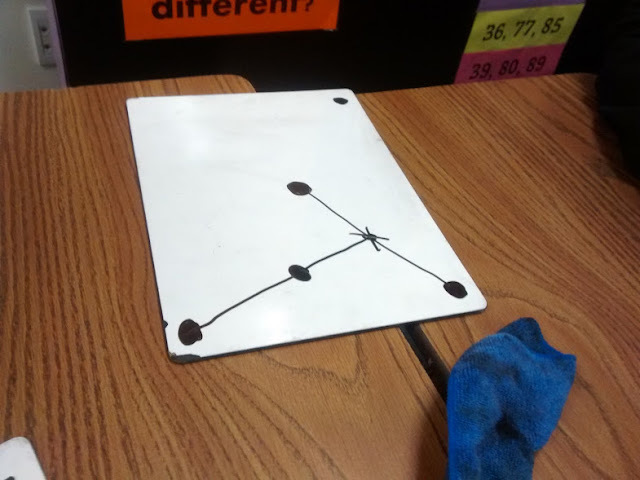 Each student uses a different colored marker. Students go around in a circle. 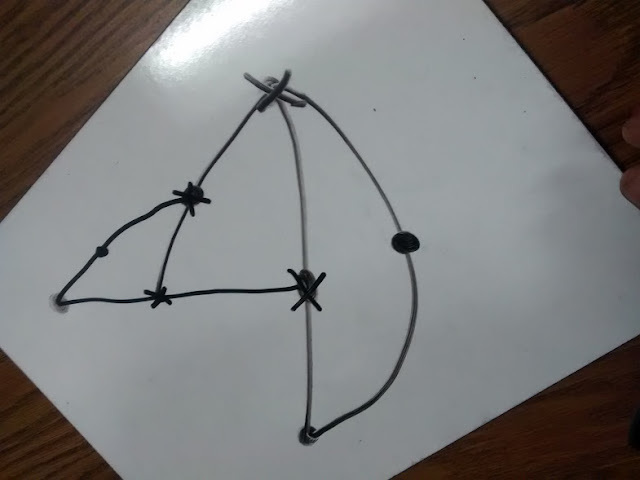 The first student must circle 1. The second student must circle 2. Students can help other students find their number, but they cannot circle the number for them. 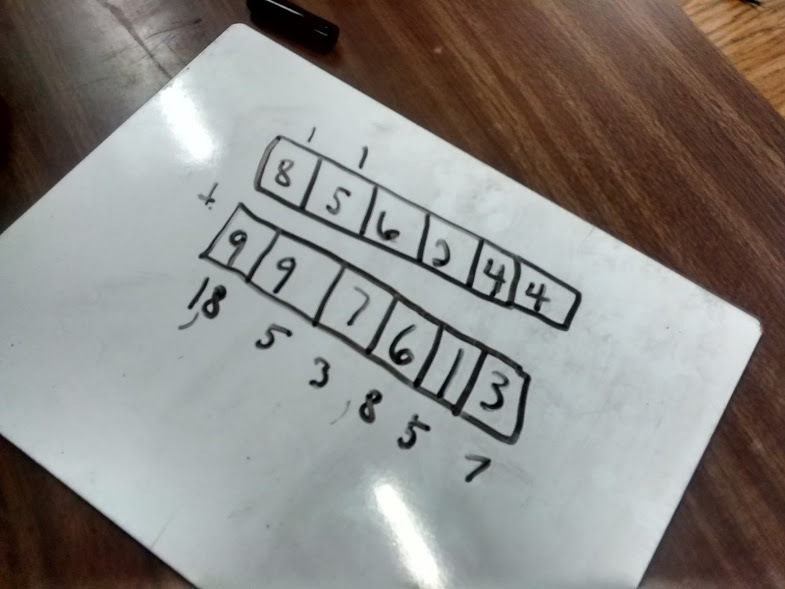 Groups have three minutes to find as many numbers (in order) as possible. Sara has groups do this several times. Some students (especially if they are in a group of four) might discover a special pattern. This is a brilliant activity for showing students what good group work looks like. All students participating. All students helping other students. Total focus. Witzzle - Witzzle Pro is a card/dice game that can be purchased from Teaching Etc. I purchased a used copy on ebay. After playing this game with students for years, I decided to turn it into an interactive bulletin board in my classroom last year. 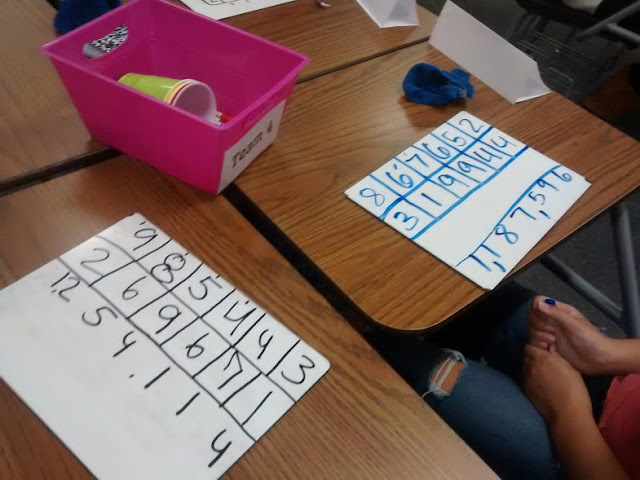 Each Witzzle card features the numbers 1-9 arranged in such a way that you can use the numbers in any row, column, or diagonal to make every number between -12 and 36 by adding, subtracting, multiplying, or dividing. You can change the order of the numbers in the row, column, or diagonal. For example, you could arrive at 20 by doing (9-5)*4 or 8 + 9 + 3. In the past, I have just projected a set of numbers on my SMARTBoard. 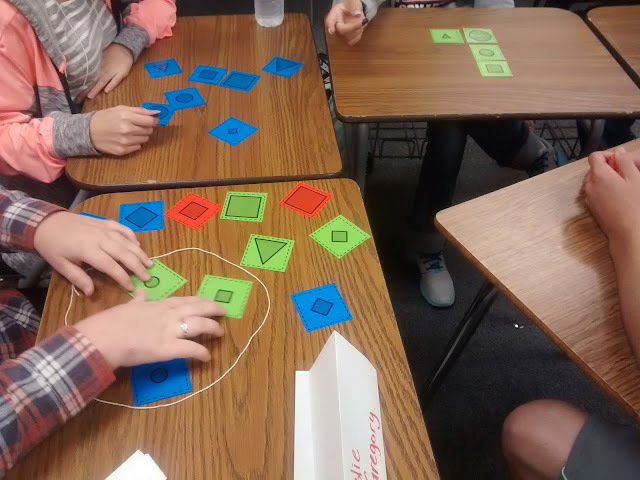 This game is the perfect way to use up those last 3 or 4 minutes of class when students get done with things earlier than you expected. I just call out a number. 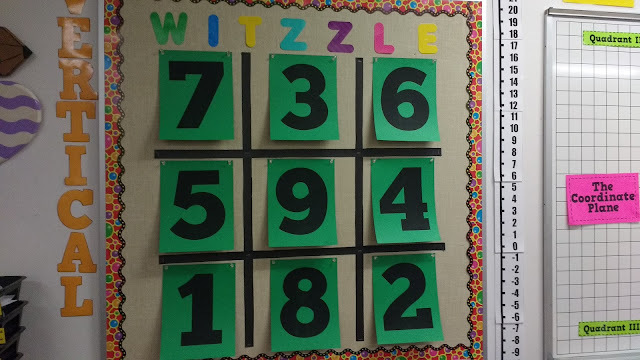 The first student to figure out how to make that number yells "Witzzle!" and share the correct solution gets a piece of candy. It makes great order of operations review! SET - Another one of my favorite math-y games is SET. If you are not familiar with SET, it is a card game that can be played alone or with a group that relies on pattern recognition. Here's the basic rules courtesy of the SET company. Though I now love the game of SET, this has not always been so. I remember reading blog posts mentioning SET for years. The SET website has a daily SET game on their website that I attempted one day. I could not figure it out for the life of me which made me feel like maybe I wasn't really cut out to be a math teacher! Thankfully, when I went to the SET session at Math Teachers' Circle, I was seated with a few ladies who already knew how to play the game. They were SUPER patient with me and let me make mistakes and learn from them. Once I figured out the rules for the game, I realized it was actually FUN! 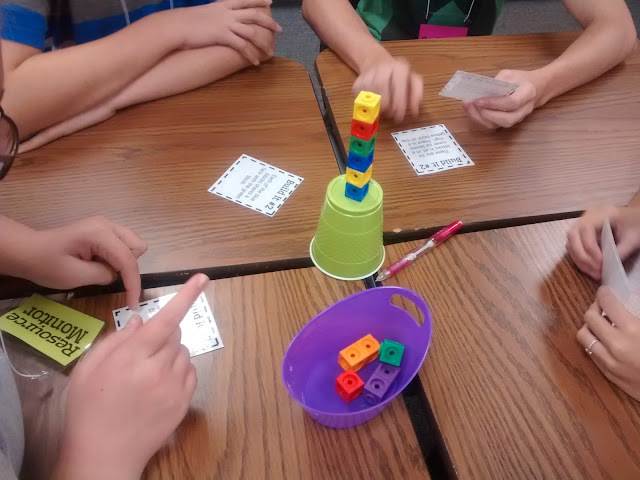 I was eager to share the game with my students once I knew how it worked! In my own classroom, I have found this animated, interactive tutorial super effective for introducing students to the game. After going through this tutorial with my students, I prefer to let them work through the daily set puzzle from The New York Times. This is DIFFERENT from the daily set puzzle on the SET company's website. What I LOVE about the New York Times version is that it comes in different levels which is great for students who are still a bit confused about how the game works. Here's an example of Basic Level 1. As you can see, all of the cards are already the same color. And, here's an example of Advanced Level 1. I have had some students become super obsessed with the SET game! One year, I had a student beg to take a deck home over the weekend so she could play with her mom. I find that if I teach students how to play SET during the first week of school that it makes a great warm-up or time-filler activity throughout the rest of the school year. This concludes my list of every single activity I used during the first week of school last year. Can you imagine how long this post would be if I included every single first week of school activity for my entire career?!? Of course, I left things off the list like going over the syllabus and setting up our interactive notebooks, but I think there's enough information here to keep you busy for a while. ;) Have fun planning your first week of school! Love the idea for using Lonesome Llama with prepositions!!! I havent even read the article but based on the title I know it will be great! Happy school year! This is awesome! Thanks for your time and effort in putting it together. I have used concept maps as a way to get to know my students better. I model making one with "Ms. Weinand" in the center and then I start putting things about me with more details on some of them to model creating a concept map. Then I ask the students to create one about themselves. I stipulate that they have to tell me at least 10 things about themselves. This has been very successful. I have also used a 4 corners activity with strongly agree, agree, disagree, and strongly disagree. I put up different statements and then the students stand in the corner that is their opinion. Some statements are informative for me such as "I like to work in groups" some are more silly such as "I like chocolate" or "I like to watch football" All of the questions give me more insight into the student but this activity has been harder to do with 30 plus students with limited moving space. Wow! These are all such great activities! Thank you for sharing! That was exhausting to read! I need to find way to plan when to use each of these! Thank you! I love the idea of the "Build It" game, and I have the cubes. Is there anyway to get a copy of the cards you use? I really don't think I would have use for the entire book. Aaaahh! Build In Between. I spent an hour trying to solve that one. Is there an error? There's an error in the original book. :( If you remove one of the cards, it will work. Sorry about that! You are a gift to the universe! Holy heaven, thank you!! I am really excited to use the "Survival in the Desert" activity to kick-off the first week of school in my social studies class. On your reflection sheet, you have the students discuss whose rankings were closest to those of the Air Force- is there another document that provides the rankings of the Air Force? I did not see it. Thank you!!! Yes!!! Is there a Air Force Ranking sheet?!?!? 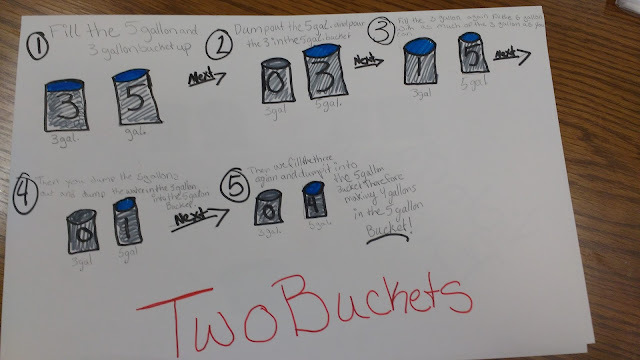 I love this activity and can't wait to see how students work collaboratively on it! Thank you!!! Thanks for sharing! Great resources to support team and relationship building. Enjoy the start of the school year! Can't wait to use your worsheets. my students will be so excited. I was hoping to find some of your famous worksheets and activities to give to my students in the classroom. I don’t want to sound stupid, but I don’t know where you get the energy to do it. I also search the net constantly in a hunt for the latest innovations to be introduced in the learning process in the classroom. However, I have never found so powerful activities that can inspire and motivate students to love the most challenging subject. There is only one thing I wanted to ask. I wonder what do you say to a student if he or she wants to buy a college essay online. It is considered cheating? As a math teacher, your blog is life changing!! So good!! I cannot wait to try many of these activities with my students! These are some fantastic resources! Thank you for taking the time to share. You make a difference!!!! Sarah, you are a amazing. Thanks for sharing so many ideas! I wanted to do the activity build it and just ordered some snap it cubes. I was wondering if you could email me a copy of the cards you use. These are all awesome. I don't think I'll have time to try all of them but I'm certainly going to try a couple. In your Make a Million activity, is it okay if they go over? Are you just looking for who is closest even if it's bigger than 1 million? And I love SET! I've never tried it in a classroom before but I might. How many do you usually have in a group for that? I also really want to try the get to know you activity. How long did you spend on each of these activities? The idea of Lonesome Llama is awesome. i really appreciate the idea with all your hard work & efforts.